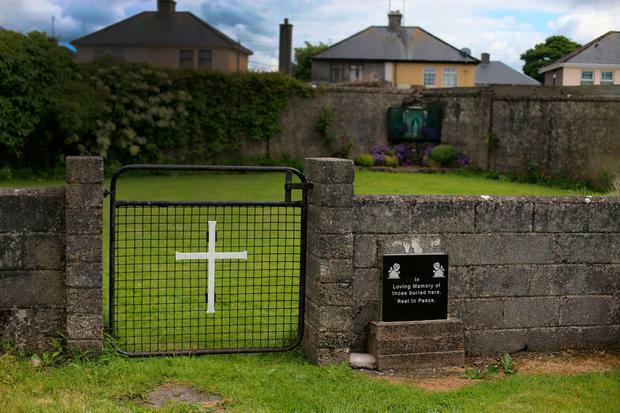 A religious order which ran a mother and baby home has failed to issue an apology after a commission of investigation discovered what are believed to be the remains of hundreds of children in underground chambers at the property. The Bon Secours Sisters said it couldn't comment on the find, which Children's Minister Katherine Zappone described as "disturbing". Significant quantities of human remains were discovered at the site of the former St Mary's Mother and Baby Home, an institution where unmarried pregnant women were sent to give birth, in Tuam, Co Galway. The find has vindicated the painstaking research of amateur historian Catherine Corless, whose work helped lead to the setting up of the Mother and Baby Homes Commission. In a statement, the commission described itself as "shocked" by the discoveries, which were made in recent weeks. Remains were found in 17 underground chambers in a structure which appears to have been used for the treatment or containment of sewage or waste water. A small number of the remains were recovered for the purpose of analysis. "These remains involved a number of individuals with age-at-death ranges from approximately 35 foetal weeks to two to three years," the body said. "Radiocarbon dating of the samples recovered suggest that the remains date from the timeframe relevant to the operation of the mother and baby home." Bon Secours nuns ran the home from 1925 until its closure in 1961. A number of the samples are likely to date from the 1950s. Further scientific tests are being conducted. In a statement the Bon Secours Sisters said they were fully committed to the work of the commission. However, no apology was forthcoming from the order. It said that on closing the home in 1961, all records were given to Galway County Council. "We can therefore make no comment on today's announcement, other than to confirm our continued co-operation with and support for the work of the commission in seeking the truth about the home," the statement said. The Irish Independent understands the commission has not yet removed any skeletons from the site but sources with knowledge of the investigation said there could be hundreds. "Nobody knows the answer to that question yet, but it will be high," one source said. As well as testing samples, specialist technology has also been deployed to study the remains in the ground. The commission is said to be satisfied that local theories about the site being a famine grave can now be discounted. Ms Corless said the announcement was "a great relief" as it provided the truth to survivors who have brothers and sisters buried there. "It is great for them to know that these children will finally be given a proper burial," she said. Ms Corless said she had been "blocked on all sides" while conducting her research, with no help from the Catholic Church or authorities locally. The reason so many children died in the home remains unclear, but Ms Corless said she believed it was due to neglect. "They were illegitimate children. They weren't wanted," she said. "I can't understand how there were so many deaths because the Bon Secours was a nursing order. They would have known about hygiene and separating the ones who were ill from the ones who weren't. "I just get the impression there was total neglect of the children." Women who gave birth were separated from their children and required to do unpaid work in the home for a year. Children stayed there until they were fostered, adopted or old enough to go to an industrial school. Ms Zappone said the find was "very sad and disturbing news" but "not unexpected". She said everybody involved must respond sensitively. * A dedicated telephone information line is being made available for people seeking further information. It is available on 01-6473118 / 01-6473232 during Monday to Friday from 9.30am to 5pm and Saturday and Sunday from 12pm to 5pm. * Anyone affected can also directly contact the Health Service Executive information line on 1850-241-850. What will happen next after shocking discovery?